Screenshot from Bernie Sanders rally in Portland, OR. This isn’t so much a trend as proven science. However, Chait (and others) typically talk about policy and how Bernie’s policy stances are going to hurt him. Sanders has promised to replace Obamacare with a single-payer plan, without having any remotely plausible prospects for doing so. Chait goes on to talk about how Bernie has difficulty talking about issues outside of his economic wheelhouse. The underlying assumption is that people vote for policies. People don’t vote for policies: They vote for personalities and they vote for identities. We vote for people who look like us. We vote for people with the same values. We want heroes and we want villains. We vote when we believe we can make a difference. We vote when there’s peer pressure. At an emotional level, I think Bernie has the edge. So do the most recent favorability polls. Nate Silver has even talked about how Bernie Sanders is the only candidate from either party with a net-positive favorability ranking. One, Hillary has been attacked in the media. Her campaign will make the case that she’s “weathered” the storm. However, according to the data, the trend is still downward. It hasn’t flattened and might still be sinking due to issues surrounding Benghazi. 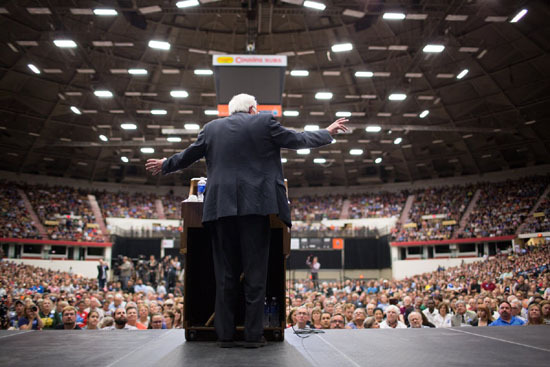 Two, watch for Bernie’s results as the Clinton campaign attacks him. If his ratings don’t change, it’s a good sign. My unofficial indicator on emotion in politics is my mother-in-law. She’s a Catholic Democrat. She hates Clinton. She hates Trump. And she hasn’t heard much about Bernie. And yes, for the record, I talked to her about Bernie only taking small campaign donations. Who knows where Jonathan Chait lives, but my guess is that his neighborhood is quite a bit different than mine. While people keep hearing that the economy is getting better, they aren’t getting better. All the benefits seem to be going to a few. If Hillary Clinton wins the primary, Hillary Clinton will be the establishment candidate. And not only will she be the establishment candidate, but there will be talk of royalty and not electing another Clinton. Clinton will counter that she has the money and resources to win because she is the establishment candidate . Jeb Bush had more than $100 million, the largest amount of any GOP candidate, and what chance does he have? Absolutely none. I talk to a lot of conservatives. Conservatives hate Jeb. Remember what I said about emotion? People are tired of the establishment. So … you don’t think they’re going to call Hillary a socialist, too? You don’t think they’re going to attack her as supporting Obama’s policies on health care? The difference is that calling Bernie a “socialist” might be all they have. It’s certainly all Jonathan Chait and the Clinton campaign seem to have. In Hillary’s case, they’re also going to call her the establishment—and the person she’s running against is likely to be viewed as challenging the establishment. Mr. Chait, you don’t think we’re gonna hear about Benghazi and “Killary” if Hillary is the nominee? It’s not that these charges are accurate. What I’m saying is that Chait’s argument that we should vote for Hillary because they’re going to call Bernie a “socialist” doesn’t hold much water, because they’re going to call anyone a socialist. President Obama has been called a socialist for eight years and Hillary will also get called a socialist—and probably a whole lot of other things as well. Both the offense and defense of their favorite team often lose whatever momentum that they have built up to that point in the game. The defense starts employing a completely different scheme than the one that allowed the team to build a comfortable lead in the first place. Meanwhile, the offense that helped to build the lead sits on the sidelines waiting for a chance to get back on the field. Often the offenses have a difficult time cranking back up when they finally do get involved in the action again. Bernie Sanders is on offense. Taking money from small donors only is a huge selling point. In a general election, I would hammer this again and again and again and continually remind people of who is backing Republicans and what they want. Bernie is right when he says he could win Trump supporters. I also think he wins more independents than Hillary, as gjohnsit here at dKos has pointed out. I think for his working class and middle class supporters, I think we can make the case that if we really want to address the issues that people are concerned about…we need policies that bring us together that take on the greed of Wall Street, the greed of corporate America, and create a middle class that works for all of us rather than an economy that works just for a few. In the general election, both Bernie and Hillary are going to be called names. Instead of playing not to lose, I’d play offense. Bernie’s been on offense and so far appears to have a better offensive strategy. Young people tend to be anti-establishment. They’re establishing their identities by rebelling. Depending on who they meet first, their views can take a couple of directions. If they meet liberals, they tend to be more in favor of democracy and social justice. If they meet conservatives, they become more anti-government and libertarian. 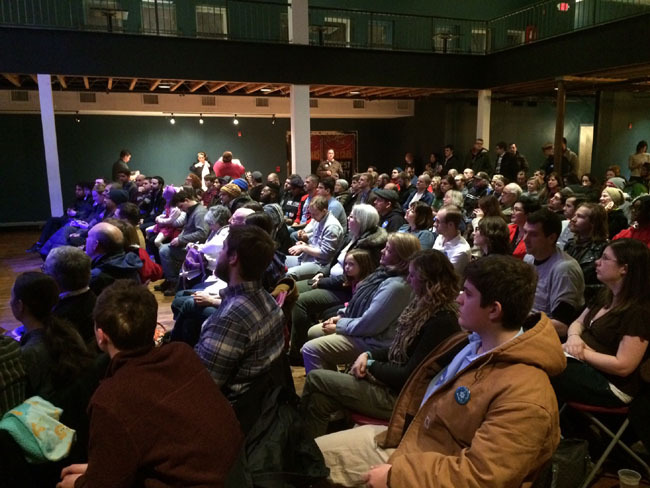 The under-34 crowd overwhelmingly supports Bernie. Not only is this the future, but it’s also a big group. For the first time in 2015, millennials (those age 18-34) will outnumber baby boomers at roughly 75.3 million to 74.9 million. If we want to activate this demographic instead of having them sitting on the sidelines, Bernie is the guy. It appears it would be easier to win establishment Democrats and independents over to Bernie, and harder to win anti-establishment and independent voters over to Hillary. In terms of socioeconomic status, our country is a triangle that is heavy at the bottom, shrinking in the middle, and very small at the top. Corporate special interests and the wealthy use top down strategies to influence politics. 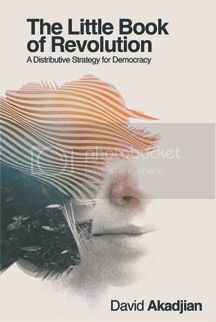 By and large, they own the traditional media and have more money to spend on influencing ideas and political candidates. They fight a top-down media fight and use their leverage to broadcast information to as many people as possible. 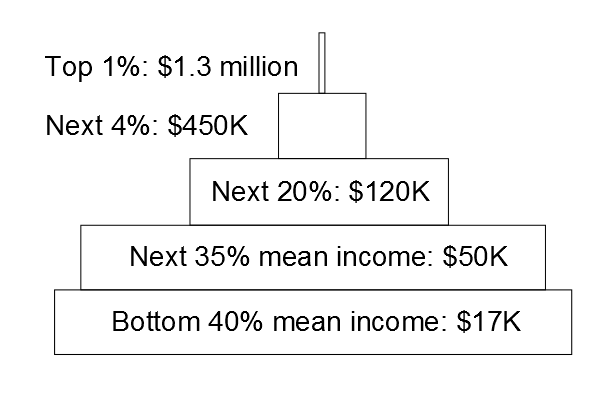 The top quintile tends to fight on their side, and they use divide-and-conquer tactics to partition the bottom 80 percent. They want a culture war because the culture war focuses attention away from the socioeconomic pyramid and the purchase of government by the top .01 percent. Toward this end, they turn Republicans against Democrats. Straights against gays. Blacks against whites. The middle class against the poor. No matter who their candidate is their strategy is going to be to try to make them look good and the opposition somehow look immoral: Liberal, statist, socialist, black, lazy, gay, communist. You recognize all the divides. The Republican Party wins the white working class by painting them as “good” and everyone else as “evil.” This is their emotional story. The Democratic Party is different. The media doesn’t promote liberal principles. If anything, it attacks them. The Democratic Party strategy is more of a bottom-up strategy. The ground game is more important. For this reason, they need excitement at the ground level, the populist level. 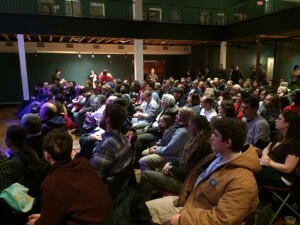 Bernie Sanders volunteers in Cincinnati. If your strategy is more of a bottom-up strategy, why promote someone who generates little excitement within the base? Basically, Republicans don’t need to excite their base as much because they fight an air war through the media. The Democratic Party needs their base to speak up and convince people because their strength is in numbers and in the ground game. Clinton argues that she has the stronger ground game. What she means is that local democratic parties and organizations want her to win. This isn’t the ground game I’m talking about. The ground game I’m talking about is populist support, and populist support favors Bernie Sanders. What do these four things mean? Here’s a few thoughts on what these things mean to different people in 2016. Keep doing what you’re doing. You’re on offense. You’ve got a great story. Keep telling it. People will try to distract you by asking for policy proposals or trying to shift attention away from your economic story. Brush these off as quickly as possible and get back to telling your story. (Notice how many Republicans ever release policy proposals? None). Even if you don’t get elected, you do amazing things for raising the economic issues of the 99 percent. You need some likable moments and a narrative other than “I’m the most likely to win.” This inspires no one. Your biggest hope is that the opposition elects a truly detestable candidate (a very real possibility with front runners Donald Trump and Ted Cruz). If you win the primary, you want someone who generates excitement and inspires millennials as your vice president. Someone like … Bernie Sanders. Kudos for finally having something to talk about in a primary. The lesson learned is that the party needs to have someone inspiring running, and that controversy gets news cycles. Maybe next time around you won’t be so afraid to have debates in decent time slots. Now if we can only get you to talk about your values and find a way to fund you that doesn’t involve corporate special interests. p.s. Can you please stop sending me those policy surveys? Most people are now to the point where they’ll tell me, “I get it. People vote for values,” or something similar. Unfortunately, these same people turn around and then start talking about some policy or other … Heh heh. The point at which they “get it” is when they change how they work to convince people. When they stop calling people stupid. When they stop saying, “You need to …” and start saying, “I believe … because …” When they start telling stories about why they believe what they believe. When they understand the beliefs of the opposition, can start from common ground, and can move people to new places. When they lead. When they model for others. When they teach. The good news is … this is starting to happen. Especially with the millennials. Chait (and others) are ignoring some big trends in this election. How is this going to be any different if Hillary wins? Look at the past eight years of obstructionism. So yes, it’s going to take more than Bernie. But it’s also going to take more than Hillary. Bernie Sanders gets this and is fighting the fight to involve people. He’s not sugar-coating it. We’re going to need better people at all levels of government. People need to step up not just for this election, but always. 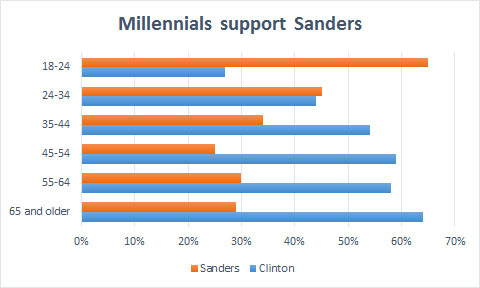 The millennials are now the largest demographic in the country and overwhelmingly they support Bernie over Hillary. It also may be easier to convince the establishment and independents to vote for Bernie than to convince the activists and independents to vote for an establishment candidate. Liberals win on the ground as opposed to the air (not that this isn’t important too—we’re simply outgunned here by corporate special interests). People are tired of the prevent defense and want someone who will fight. Bernie’s campaign brings an energy and a fire that Clinton isn’t capable of mustering in an anti-incumbent election.